As originally conceived in 1956, the purpose of the Flint Genealogical Society is to encourage, aid and share research information. We strive to promote and educate others interested in genealogy, and to procure, preserve, publish and distribute both genealogical and historical materials. Voting Delegate: Gerald A. Little Jr. The Flint Genealogical Society is a non-profit 501(c)(3) organization, incorporated within the State of Michigan exclusively for charitable and educational purposes. With more than 2,300 members in our 58 years of experience, we have developed a rich History of our own while proudly serving the Flint and Genesee County area of Michigan. Our Board of Directors, Officers, Trustees, Committees and Membership are governed by our Constitution and ByLaws operating within Robert's Rules of Order, Revised. 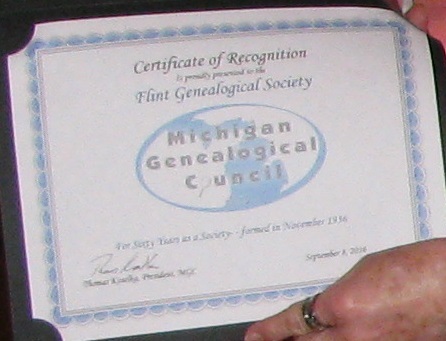 The Flint Genealogical Society was formed in November 1956. November 2016 marked our 60th Anniversary. Fischer Hall - 613 S. Main St.
60 years as a society by the MGC. certificate presented by the MGC.